Ethiopia, Eritrea and Somalia established a joint cooperation agreement this week, in another major step towards achieving stability in the conflict-ridden region. So is peace finally on the horizon? The decades-long conflict between states in the Horn of Africa seemed all but forgotten this week as leaders from Ethiopia, Eritrea and Somalia worked to strengthen long-lost diplomatic ties during a tripartite summit in Asmara. And their efforts already seem to be paying off. Shortly after the three countries formally agreed to enhance economic, political, social, cultural, and security cooperation, Ethiopia opened its first embassy in 20 years in Eritrea on Thursday, less than two months after Eritrea reopened its own embassy in Addis Ababa. Meanwhile, Wednesday marked the formal reopening of Eritrea's ports to Ethiopian trade -- another major step in the peace process. An Ethiopian cargo ship docked in Eritrea's Massawa port as it prepared to transport zinc to China. Ethiopia's new reformist Prime Minister Abiy Ahmed is widely credited for pursing peace talks with Eritrea and opening up the possibility of diplomatic thaws between neighboring states in the Horn of Africa. Eritrea and Somalia had agreed to establish diplomatic relations in late July following Eritrea's rapprochement with Ethiopia, following tensions over Eritrea's alleged support for Somalia's extremist rebel group, al-Shabab. Ethiopia and Eritrea formally cut diplomatic ties following a brutal border war between 1998 and 2000, which claimed the lives of at least 100,000 people on both sides. A border demarcation backed by the United Nations (UN) in 2002 was meant to settle the dispute for good, however Ethiopia refused to follow its recommendations and continued to hold on to territory meant to be under Eritrean control. 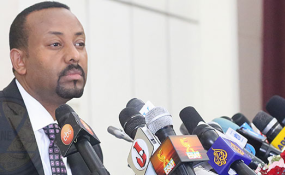 Only two months after taking office, Abiy announced in June that Ethiopia would hand back disputed areas, including the flashpoint town of Badme where the first shots were fired, beginning the border war. Ethiopian journalist Sisay Woubeshet told DW that the peace talks between Ethiopia and Eritrea are especially significant for families divided for years as a result of the conflict. "It's been a very big and exciting year for Ethiopians," she says. "Because people have been separated from their families for more than 10, 20 years. Eritreans [in Ethiopia] have been looking for an official and formal way to communicate with their families and friends and this is the first step. The opening of the embassies makes the situation more stable for them." It remains unclear however when the heavily militarized Ethiopia-Eritrea border will formally open, or when Ethiopian armed forces will withdraw from the disputed areas. A transformation of regional politics? The rapid peace talks between the former enemies appear to have opened a pathway to pursue further resolutions, potentially changing the landscape of politics in the region. In the wake of the recent diplomatic breakthrough, Ethiopia and Somalia are now urging Eritrea to begin a dialogue with Djibouti to solve their own border dispute, which occurred back in June 2008 when armed clashes broke out. On Thursday, the foreign ministers of Eritrea, Ethiopia and Somalia travelled together to Djibouti -- the first initiative of the Joint High-Level Committee established by the three countries during the summit. Djibouti's Foreign Minister Mahamoud Ali Youssouf said the visit from his Eritrean counterpart would "open a new era in relations between our two countries. Now is the time for peace." Martin Plaut, a fellow at the Institute of Commonwealth Studies who specializes in the Horn of Africa, believes steps to include Djibouti in the peace process could signal the end of longstanding tensions in the region. "There a still a number of issues which need to be resolved, such as where the border is and the return of bodies and prisoners and so on," he told DW. "But if this can be resolved, it is frankly the last piece of the puzzle." However, the fact that there a still a number of contested regions along the Ethiopian-Eritrean and Djiboutian-Eritrean borders has observers concerned that the newly forged diplomatic ties could unravel if flashpoint areas are not properly managed. "All they've done is to say 'we now love each other'," says Plaut. "But we must now oversee the transfer of villages and areas. How are they going to manage their currencies along the border? What customs points are there going to be?" "There are still dozens and dozens of complex issues which need to be resolved between them." Zipporah Nyambura contibuted to this report.